These fun, foot-shaped strapless sticky sandals are designed to help protect the soles of the feet during spray tanning sessions. To apply, simply remove the adhesive backing and step firmly on the foot pad. May also be used to help protect feet at health and fitness clubs, during pedicure treatments and at airport security checkpoints. We stock a variety of disposable spa slippers for foot protection and enhanced comfort. Both the disposable and reusable slippers are excellent products for spas, salons and other beauty service environments. We have wholesale salon slippers made from quality materials, which are conveniently one-size fits all. Some of our best-selling slippers feature the pampering comfort of soft, absorbent terrycloth. 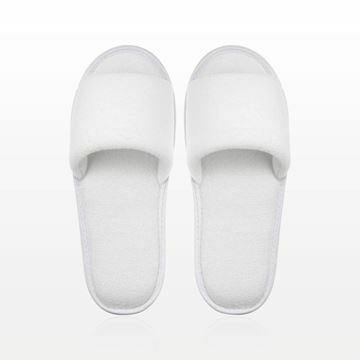 The open-toe terry slippers are a popular choice among luxury spas. We also have spa slippers with non-skid construction for greater peace of mind. Our disposable pedicure slippers support hygienic services. Strapless sticky sandals, also known as “sticky feet,” are an innovative product that safeguards the bottom of feet during spray tanning sessions, pedicures, fitness club visits and airport screenings. These disposable sandals provide sanitary protection when shoes must be removed in public spaces. Their sticky soles can be applied quickly. Whether pampering comfort or basic coverage is needed, we have the slippers, socks and shoe covers to support the needs of your customers. Within the Qosmedix apparel collections, our wholesale pedicure slippers meet specialized service requirements. The disposable slipper selection includes thong and open-toe designs. The thong style is popular for pedicures. These slippers also protect feet comfortably during a full range of salon services. We carry disposable pedicure slippers in economical materials, such as linen and rayon, for an affordable option in protective apparel. Qosmedix supplies wholesale spa slippers in bulk quantities for businesses. Discover how our products offer superior value and quality today.